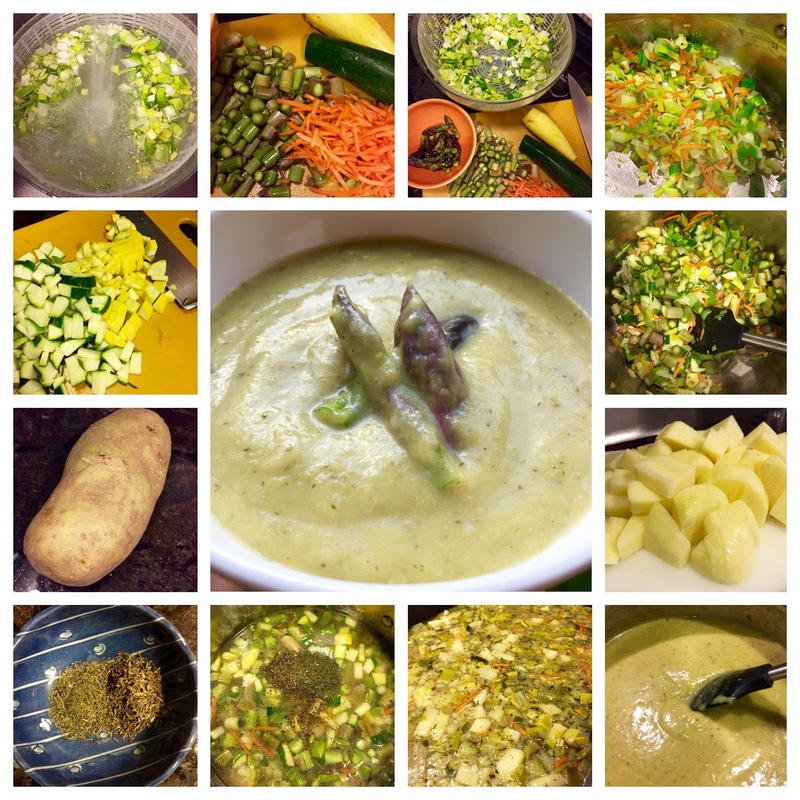 Making a vegan/vegetarian creamy soup is easy, all you need is a potato to give it that creamy texture. I have officially completed 4 weeks of my elimination diet. I feel great! Not quite as achy in the knees; my complexion is glowing; I've lost at least 8 pounds and I can almost fit into pants I haven't worn in three years. I feel progress. Had I not been laid up with a kink in my back last week with pain so intense that I sought out a chiropractor, I think I could say this diet has been a success. It is a success. I am clean eating in a way that I haven't eaten in over three years. I love finding ways to incorporate more healthy whole foods into my diet, and with asparagus in season, adding one of my favorite spring vegetables to my meals is a treat. At this time of year, with plenty local Jersey "Grass" to eat, straight from The Collingswood Farmers' Market to my table, my meals have been superb. When I purchase the asparagus, typically from Viereck Farms, I know that Les and his team have picked those spears on Thursday or Friday and bring them to the Market with as much love and care as they were grown and picked. Gotta get your bunches early though, by 11:30, Les' crates are empty. The bunch I picked were a good size, not too skinny and not to fat, just right. For this soup, you could use chicken broth or a commercial vegetable broth, but I say, why bother? Use water, add in more veggies and make your own stock as you make this soup. Prep time is maybe 20 minutes, cooking time, another 20-25. Cool it bit, then puree and back to the soup pot. Season, taste, adjust. It's simple, I promise. Wash and prep all the vegetables. It is imperative you clean the leeks thoroughly, removing all traces of grit and sand. If possible, wash the cut leeks in a salad spinner, using several changes of cold water until all dirt is removed. When cutting the asparagus into pieces, reserve the tips for garnishing. Cut the asparagus tips in half lengthwise and set aside. In a large stock pot heat over medium-high heat the 2 tablespoons of olive oil (or you can use coconut oil, canola oil or safflower oil) until the oil shimmers. Lower heat to medium and add in the cut leeks, sauté them until they turn slightly translucent, about 5 minutes. Add in the cut carrots and sauté for 2-3 minutes. Add in the zucchini and squash and sweat all the vegetables until they all begin to release their juices, about 5-8 minutes. The vegetables can and should begin to take on some colour, turning slightly golden, but not browned. Add in the peeled and diced Russet potato, the 5 cups of water, and the tablespoons of dill weed and thyme leaves. Season with a generous pinch of kosher or sea salt and a few grinds of freshly cracked black pepper. Bring the mixture to a boil, then reduce the heat to a simmer. Cook the soup for 20 minutes or until the potato pieces are fork tender - not quite falling apart but tender enough to break apart when pierce with fork tines. Cool the soup in either a large shallow pan/bowl until it is cool enough to puree. Working in batches, puree the soup until it is perfectly smooth. Pour the puree back into the soup pot and heat through. Season with a few grates of nutmeg and taste and adjust seasonings, adding more salt, pepper, dill and thyme. Add in the reserved sliced asparagus tips. To serve, heat thoroughly and garnish with a drizzle of good quality extra virgin olive oil or add a dollop of vegan pesto to the soup. Makes 6 servings/6 cups soup. Cool and refrigerate in a tightly covered container. Keeps for up to 1 week, or freeze for up to 2 months. Freeze in small batches. Notes: You can use low-sodium chicken broth or a low-sodium vegetable stock. If you can't eat potatoes, omit the Russet potato. If you can have cream/milk or soy, go ahead and add in a bit after the soup is pureed to give it that creamy texture. Using the Idaho/Russet potato is a trick I learned from my stint cooking at Jill's Vorspeise in the Reading Terminal Market. It adds a creamy texture without adding in the fat or calories or dairy that I can't at the moment tolerate. This is a beautiful post, Denine, and I particularly like the photos arrayed as you have with the finished product in the middle. Very thorough and attractive. Thank you David. I enjoy workign with a few apps on my phone that allow me to make photo collages easily. This really is a simple recipe that turns out beautifully! Great post, Denine! Who couldn't use MORE veggies, veggies, veggies all the time:) You should be super proud of yourself! Donna! you are so right! and thank you, I am proud of my accomplishments and for finding ways to create new exciting recipes to share!